Khetri is the very first town of Jhunjhunu district after entering the state of Rajasthan from Narnaul (Haryana), it is also the second largest thikana of Shekhawat Rajputs. The town is known for copper rich mines these days. There is a big plant of Hindustan Copper Ltd. in Khetri. Raja Khet Singh Nirban of Nirban-Chauahn Rajput clan founded the town, later this town was conquered by Shekhawat Rajputs and awarded to Thakur Kishan Singh Ji by his father Maharao Shardul Singh Ji of Jhunjhunu. Khetri is also a part of Panchpana. Raja Ajit Singh Shekhawat of Khetri was a far sighted and wise ruler, he built many forts, palaces and temples. Swami Vivekanand was also a close friend of Raja Ajit Singh. A statue of Swami Vivekanand is installed on a street roundabout of Khetri as memorial. Raja Sardar Singh was the last titular Raja of Khetri. Raja of Khetri was also once the employer of the Nehru family. Pandit Jawahar Lal Nehru’s uncle Nandlal Nehru was chief minister (Diwan) in the Khetri royal court. Motilal Nehru also spent early years of his life in Khetri only. Khetri is situated between hilly locations of Aravali range. 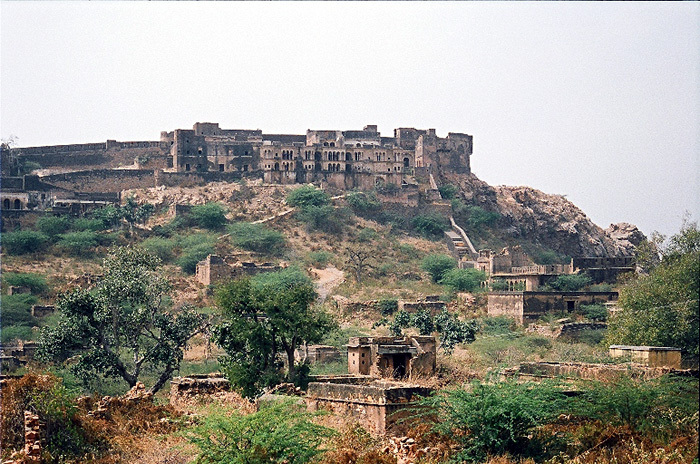 1- The main attraction in Khetri is the fort built by Raja Ajit Singh Shekhawat Saheb Bahadur. It is the highest point of Khetri for a panaromic view of the town and surroundings. A wind palace was also built in Jhunjhunu by the rulers of Khetri. There is a minor influence of frescos in Khetri buildings; these are plain but very artistic as far as sculpture is concerned. 2- A temple of Gopinath ji was also built by the Khetri Royal house; the same is open for general public now. Other than this, temples of Bihari Ji, Ganga Mata, Hanman Ji, Siddhi Vinaayak and Bhatiyani Ji ka Mandir are the old famous buildings. Few temples are situated in the fort are ther ebut not open for the public. A beautiful temple of Baba Rameshwar Das in Tibba Basai is 30 KM from the town, those seeking peace of mind and spiritual guidence can visit this temple. 3- Pannasar Talab (Pond) is an artificial lake to store the rain water, Ajit Sagar Bandh (Dam) is a modern water reservoir built by the authorities, it is in mid of a beautiful location surrounded by lush Green Hills. For research students and miners the Hindustan Copper Ltd. plant is also an important location, please check prior to visitng the mines as generally it is not allowed to visit the plant by public. Nearest railway station is Narnaul, which is 40 KM from the town and the nearest Airport is IGI New Delhi. Rail route is not suggested as the direct connectivity from Jaipur and Delhi to Narnaul is not good as of yet. For a quick arrival the road route is recommended while coming from Delhi. khetri is a most popular town in rajasthan.it is a very good example of architecture and nice fort,havali,temples and lake or pond.everyone should visite this town. very niccce palace its amazinnnng …….. I love khetri the city seems just like kashimer. i like khetri forts this place a tourist place. khetri is very Good place. it is town of temples. I like khetri very much. Everybody has appreciated and feel pride on Khetri , but there is also to be noticed how this town is maintain, if the Mr. Kairol a British resident of the than period of Khetri Thikana who taken lot of interest to build its ground water system ,comes back and see it , definitely he will cry. The very moment you enter from the darwaj (Gate) near petrol pump to enter in the real town you will find once so deep that an elephant can pass under it, now become a dump yard of waste of the town. The river flowing under it was having whole year water has now become a Gandaa Nala, thanks to the people and authorities , encroachment had been done on the dam (Tijoin Vala Bandh) and check dam at jhojhu ,which were the source of flow of water. A lot of encroachment has taken place on the streets and Aam Rasta of Khetri town which were quite wide enough earlier thus making these streets and Aam Rasta a narrow lane causing lot of difficulty as resident also park their vehicles on street as per their will and whim. I fail to understand when concerned authority will demolish these encroachments. Road connected from Singhana side as well as from Neem ka Thana side are in very pathetic condition. Anybody can understand looking to the condition of road, how concerned authorities are maintaining theses basic facility of the town. In the year 1976 water supply system introduced through pipe line but still town needs proper supply of water and system, I have seen in many wards people still run from here to there to fetch water from any source or those capble purchases from private water supplier. Near Talab an overhead water tank has been constructed but never used due to its faulty construction, who is responsible for waste of public money GOD knows. extremely disturbing but true, I spent my childhood in Khetri Nagar and Studied at KV No.1 upto 1974, I keep visiting once in a while and can understand the difference then and now and deep anguish and angst in your composition. All people and places is very nice. Please advice how to reach Government College in Khetri (via train).